It's a hot summer July day in Berkshire County, MA - lots of bugs, lots of sweating...why not go for a swim? No, lets go for a walk in the woods! Dan Burt is foraging -- he is on a mission to find the beautiful plant called Yarrow to make one of his signature drinks - a Yarrow Beer! By using the Yarrow, he creates the light, flowery, stimulating, bitter tasting gruit (the difference here vs. traditional beers is that he will not use hops). Yarrow flourishes around the summer solstice and grows in the wild in sunny patches in places such as fields, pastures, meadows, and along roadsides all the way from California to Massachussets and from Great Britian to the Himalayas. Yarrow loves temperate regions and hangs in the same areas as Queen Annes lace (its a good friend) -- which is why it can often be confused with it due to appearance. An easily distinguishable characteristic is that Yarrow has a lacey flower with thousands of little green leaves which accounts for its latin name "Achilleas Millefolium" meaning the thousand leaf plant of Achillies. The leaf is important to look for in harvesting because that is what makes Yarrow stand out and distinguishable from any other similar looking plant. The first historical mention of Yarrow is in Homer's epic poem "The Iliad" which was written around the year 700 and is one of the oldest surviving books in Western literature. The book states that Achilles (the hero of the story) was taught how to use this medicinal herb by The Centaur (his mentor & "goat man"guru) to stop the bleeding of wounds by placing the plant on a cut or injury. The flowers of Yarrow contain a protein which induces blood clotting. He also taught him how to make a wine that was made from the Yarrow that would induce "blood lust" to be used to rile up the gang before battle (lets call it the "tequila" of today). Over the 11th - 16th centuries Yarrow's popularity increased. With the rise of Lutheranism gruit became increasingly associated with witchcraft. Poor Yarrow started to get a bad rap and became commonly known as "Devil's Nettle". Hype over the "Devil's Nettle"and other gruit herbs culminated in the creation of the German Beer Purity Law. The law, established in 1516, outlawed the sales and distribution of Yarrow infused ales and other gruits. During this period hopped beer became the beer that we know today. With the resurgence and polarity of home brewing, people are starting to get back to their roots and becoming more creative with the palette of nature in how they brew a beer. Dan Burt is one of them. His curiosity has led him on a journey to find the allure and excitement of the wild and bring that beauty back into his life through his elixirs -- and thus his Yarrow Beer is born. You can purchase Yarrow by the pound, but Dan says,"It is pretty easy to find the Yarrow. It grows a lot right here in our backyard, and finding it is half the fun!" Dan's passion and research led him to a book called "Sacred & Herbal Healing Beers," by Stephen Harrod Buhner, where he took a recipe for a traditional Yarrow beer and tweaked it to make it his own. Mash malt with water at 150 degrees fahrenheit for 90 minutes. Boil remaining water and sparge (drain) mash. Boil all with 1.5 ounces of dried yarrow OR 3 ounces of the fresh Yarrow plant. Let cool to 70 degrees fahrenheit, place in fermenter, put reminding 1.5 dried Yarrow (or 3 ounces of fresh) in muslin bag (cheesecloth) and hang in fermenter; add yeast. Allow to ferment until complete. Prime bottles, fill and tap! Ready to drink in two weeks time! Instead of malt, use 6 pounds of brown sugar to make the wort (sugar water). Follow the rest of the recipe above, except add all the fresh yarrow to the wort itself. Do not boil the Yarrow. Allow to steep until cool. Dan says that there are many other alternative ways to enjoy this gorgeous gift from mother nature without drinking it (when drinking, do so responsively...or at least mildly responsively). Add it to your wildflower arrangement and admire its beauty. Use it as a hot tea for colds, flu and fever. When a body sweats more it will help reduce fever, encourage cooling of the body, and it also leads to improved cleansing of waste products from the body. Make it into an ointment to treat skin problems, heal wounds and bruises. It can be used to stimulate your appetite and digestive activity. Helpful with diarrhea and irritable bowel syndrome. Brings about a regular menstrual period. Treats circulation problems and high blood pressure. Strengthens small blood vessels, or capillaries and it can tone varicose veins. It is good for chapped, sore hands. Can be made into a balm that has anti-spasmodic properties and relaxes the muscles that the balm is applied over. 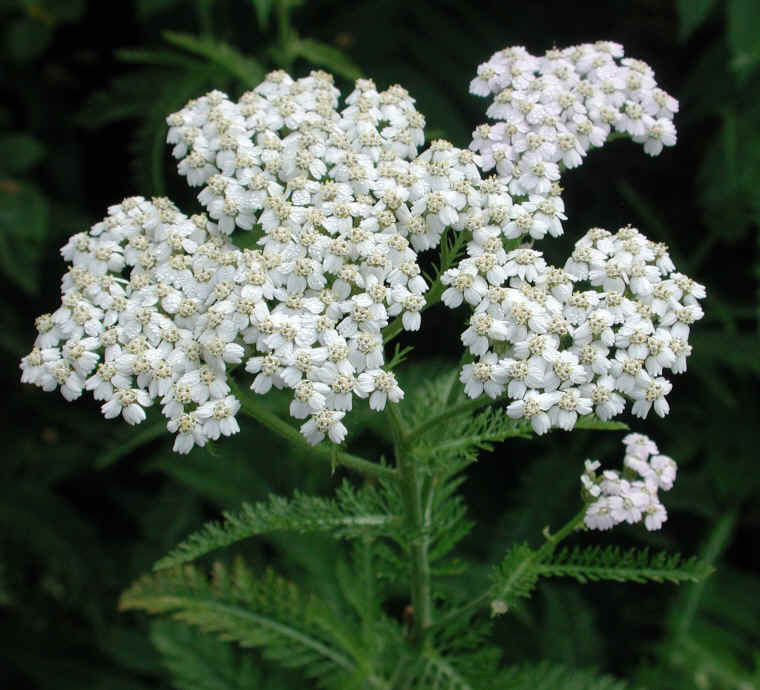 Yarrow also provides many aphrodisiac properties...just sayin:). *If you are pregnant or breast-feeding it is not advisable to use Yarrow. If you are allergic or hypersensitive to arnica, calendula or chamomile you have a very good chance of being allergic to Yarrow. As with any type of medical treatment, you should always check with your doctor before starting to use an herbal remedy. It could react with other medications you are taking in an adverse manner. However, using natural herbal remedies can help you feel more in control of your health issues. This will help give you a positive attitude, which always helps when dealing with health issues.